In one way or another, all women have been negatively affected by patriarchy, whether this be consciously or subconsciously. We’ve been conditioned, even as young girls, to be smart but not too smart; otherwise, boys won’t like you; don’t be too loud, good girls are always prim and proper. These statements can be translated to being quiet and subdued, have opinions, but don’t voice them out too much or you’ll be branded shrill and demanding. Our role is to support the man as he makes a living while women take care of the household and the children and so on. All these things compounded together have led us to a world where there is a severe lack of women in leadership roles in the workplace, marketplace, and government. As of 2015, of the Fortune 500 companies, only 5.2% have women CEOs. It’s time we dismantle the patriarchy that always relegates women to the backseat of society. I am a mother and a wife. And for society, that means I need to give up my career aspiration, otherwise, I’m being selfish. But I didn’t let society stop me. I pursued entrepreneurship and successfully launched several businesses in both my native land of Nigeria and my adopted home, The Netherlands. What I learned was that women are capable of so much more than we are given any credit for because women are capable of fulfilling all these roles successfully; it is not an either/or situation. In my pursuit of leadership, I am also giving my children some of the best lessons in life: for my daughters, I’m showing them that they can grow up and aspire to be leaders themselves and not to let society dictate their limits. For my sons, to learn that women are their equals and just as capable and talented as they are. There are four core skill-sets that we need to develop so we can answer the call to leadership: Commitment, Communication, Confidence, and Connections. We designed the Rise & Lead Web Mentoring Masterclass Series as an answer to each of these skills, to equip women with the tools they need to rise to leadership and impact real change for other women in their community and around the world. You may know where you want to go, but you need a map to get there. Module 1: Your Step-Ladder to the C-Suit focuses on creating a leadership vision for long-term career success. We believe that with a well-structured and mapped-out process, women can achieve their dreams and aspirations. Commitment is essential, but to strengthen commitment you need to have something to commit to. Breaking down our responsibilities into tangible and achievable goals takes our dreams and turns them into a strategic career plan. Being a great communicator is a necessary skill for any leader. Communication isn’t just knowing how to talk; it’s about being able to communicate your vision and having people believe in them. Learning how to communicate or share your story is one thing, but understanding how to structure and deliver real transformation is another. Module 2: Become a Bold Communicator has been designed to address all these things. There have been many studies about the correlation between confidence and success. A lack of confidence could severely undermine your performance. To achieve greater success and make more significant contributions to organisational and personal goals, it is essential that you become more confident and assertive. Module 3: Mindset Reboot: Your Leadership Confidence explores ways to increase your visibility, approach new people, and, most importantly, deal with difficult situations with boldness and composure. Leadership is not an isolated role. A great leader knows how important connections are, within their workplace and beyond. The connections you make not only expands your influence, but it also expands your knowledge, opportunity and resources. Module 4: Building Strategic Alliances – with Stakeholders focuses on how to build and grow your strategic network, stakeholder mapping and social capital inside and outside your organisation. There is one core skill that we didn’t include, but we won’t call it a skill as much it is a value: Courage. Do you have the courage to take the steps towards rising to leadership? Take the first step in your journey with the Rise & Lead Web Mentoring Masterclass Series. Find out how you can register here: https://www.riseandleadwomen.com/webmentoring/. Ebere Akadiri is founder of Ataro Marketplace. She assists entrepreneurs to develop sustainable businesses, and business professionals to gain the courage to rise and lead in the workplace and marketplace. 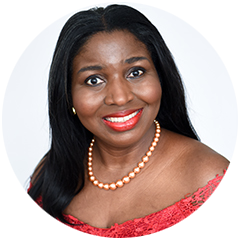 Ebere Akadiri is a Food Entrepreneur, Brand Development advisor, Women in Leadership advocate, writer and keynote speaker. She is a change-maker and champion for inclusion and diversity.